Put the medium ground coffee into the cloth filter and tilt the filter until the coffee settles then using a spoon, indent the outline of a circle in the center of the ground coffee. Pour hot water from a kettle with a long and narrow spout gently and directly into the centre. 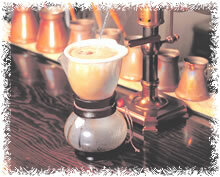 Let the ground coffee sit and immerse in the hot water distributed evenly. Starting from the centre, pour more hot water using clockwise circles to the coffee near the borders but do not pour hot water into the fringe between the ground coffee and the cloth filter. Giving more satisfaction, cloth filter add more to your coffee experience compared to paper filters when brewing coffee. Pouring hot water for the third time, you will notice a large amount of tiny bubbles surfacing on the coffee. Larger bubbles indicate that the temperature is too high while fewer bubbles indicate that the temperature is too low or the coffee is not fresh enough. For one cup 150ml (around 5 oz), using medium ground coffee 10 - 12g (about 0.3 - 0.4oz) with 90 degree Celsius (around 194 Fahrenheit) hot water. If you desire a stronger tasting coffee, repeat the number of times you puor the hot water. Make sure to control the water volume that you pour each time. Try it out and see if you can slowly master this technique and brew superior tasting coffee.